Menu creator, cocktail maker and staff manager – but a mixologist he’s not! Tell me a bit about your journey before joining Pulitzer? Originally from Romania, Bucharest, I first moved to Amsterdam seven years ago and have since had the opportunity to work for a number of great bars. I started out working at House of Bols, which has been producing Dutch gin since 1664. I trained with them and began developing drinks and strategies with them in my early 20s. Just before joining Pulitzer, I was at Rose’s Cantina and then Feijoa – one of the first real cocktail bars in Amsterdam outside of hotel bars. The Pulitzer Bar was associated with big names in the industry such as cocktail connoisseur Andrew Nicholls and it just seemed a great bar to be involved with. Is it common for hotel bars to play such a prominent feature in Amsterdam? Historically, hotel bars here were considered just a convenient place you can have a drink, unlike say London or New York, but they’re becoming a separate entity now and so many hotel bars here are upping their game. 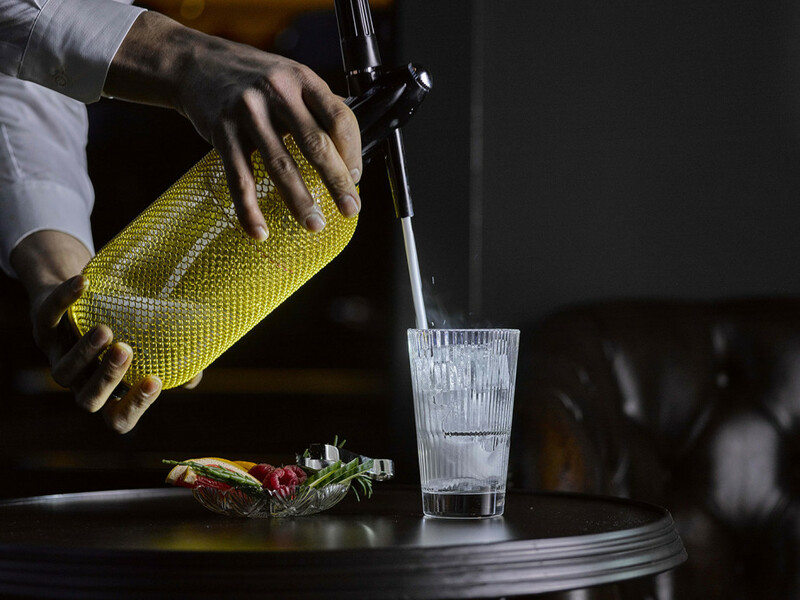 Seven years ago, there were about three proper hotel cocktail bars in Amsterdam, there’s now over 30 and each of these bars is looking closely at their drinks programme and the experience they can offer. I guess we’re following an age old London trend in that respect. Tell me more about your drinks menu? I like to involve the entire team in some way and we look to change our menu every year – it takes a lot of thought and experimentation. We’ve just launched our Great Gatsby menu in a bid to truly reflect the mood and identity of the Pulitzer, from the main library and books around us right through to the lavish interiors. sort of mix between a Manhattan and an Old Fashioned, it’s something a bartender would drink, a serious drink – I like to think of it as a gentleman’s handshake. It’s an intense sherry and whiskey-based drink with hints of tobacco, earl grey and aromatic leaf bitters. Another great one, is the Valley of Ashes, which was inspired by the industrial dump zone – it’s served in what looks like an oil drum, a sort of rustic gold barrel with a little Corn ‘n’ Oil, Bourbon, long pepper falernum, lime and lemon sherbet, Aphrodite bitters and pimento dram, and a beautiful layer of edible ashes. What’s your favourite gin concoction on The Great Gatsby menu? The Dashing Daisy. It’s a real zesty drink that’s enhanced with some floral notes and an exotic citrus marigold infused Tanqueray 10, mandarin and calamansi shrub, orgeat syrup, egg white and Peychaud’s bitters. In the UK, we’re still seeing a seemingly unstoppable surge in gin. What do you think dictates spirit trends? for that big bubble to burst. I think trends start with a community of bartenders presenting the same offer. For example, in Spain, back in 2007, you’d find these big fishbowls of gin and tonic everywhere and brands caught up with it and pushed it in different countries. A similar situation happened with the Aperol Spritz on the back of that. Almost no one was drinking Aperol a few years back and suddenly it got a new lease of life and it was being drunk in a wine glass in all the major cities. More recently, there has been a big trend towards rums as a more versatile spirit and many people are making their own rums. Rye whiskey has also picked up recently – I’m not sure why – as an alternative to Bourbon for cocktails. I think we expected vermouth and amoro to pick up, but we’ve been waiting two years and it really hasn’t. In terms of outside factors, I think the demand on bars/bartenders to shorten that execution time for making a drink also has an impact on consumer spirit trends. Would you call yourself a mixologist? No. I hate that word. I just call myself a bartender, we might create drinks and menus or manage people but at the end of the day, and I think that goes for most bartenders in Amsterdam, we jumped into this industry to be bartenders. I think the whole ‘mixologist’ term is quite an American thing. Do you champion Genever and the more traditional Dutch spirits at Pulitzer? In some ways, to a newcomer or tourist, but we like to use and create great cocktails with all spirits. I’ve worked with Genever for over four years and it can play well in some drinks, but it’s also a bit of a bully. It depends what type of Genever you use too as it can overpower a drink like an overproofed rum. Having said that, there are some great recipes you can make with it, like the Improved Holland Gin Cocktail which features Genever with absinthe and angostura aromatic bitters. The Holland House is a lovely dry one, which couples Genever with vermouth, marachino and lemon. And of course, the Pulitzer Old Fashioned, that uses an aged Genever – Zuidam 12 Years Old Korenwijn, fermented pineapple syrup and some creole bitters. We’re out of time. Do you have a top hotel bar recommendation? I think the Dandelyan at the hotel Mondrian is great and I love everything they do there. The Connaught Bar, also in London.